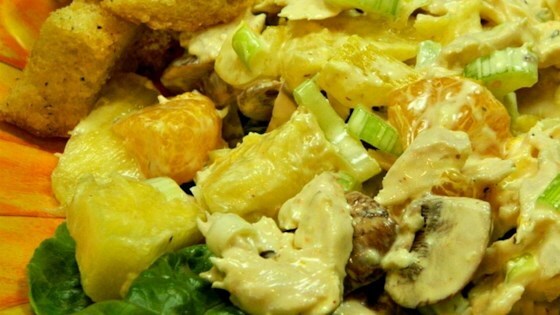 "When I serve this chicken salad, people ask for the recipe. It's different and very very good." Combine drained pineapple and mandarin oranges in a bowl; cover with plastic wrap and refrigerate 8 hours to overnight. Stir mayonnaise and mustard together in a bowl; add chicken, celery, mushrooms, green bell pepper, olives, and onion. Stir mixture until evenly mixed. Cover bowl with plastic wrap and refrigerate 8 hours to over night. Stir pineapple and oranges into the chicken mixture to coat. Spoon into lettuce leaves and top with croutons to serve. Make your salad a delicious meal! I love the pineapple chicken combination w/salad so I gave this recipe a try and loved it! I used green peppers instead of celery. And I also used chipotle mayo.